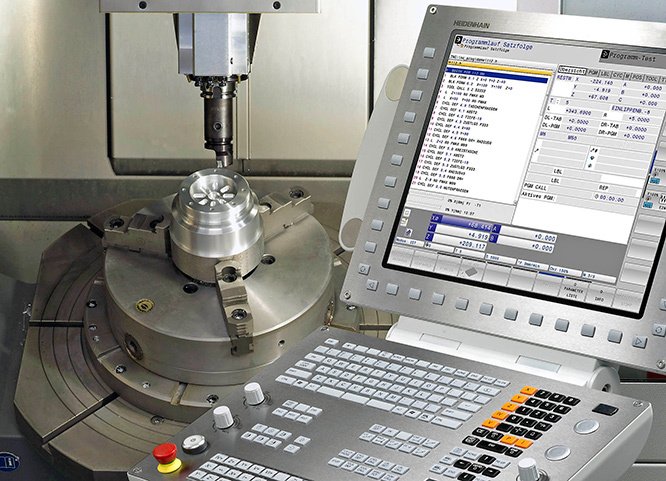 Heidenhain will use the MACH show in April to demonstrate the ease with which digital data can be transferred to and from its high-end TNC 640 CNC system for controlling machining centres and mill-turn centres. Functionality enables all participants in a paperless order handling environment, including design, programming, simulation and production planning staff as well as machinists on the shop floor, to communicate and exchange data seamlessly. Standard features of the control provide access to manufacturing process data through a CAD viewer, PDF viewer, image viewer and built-in web browser. Operation of web-based documentation software or ERP systems is possible, as is access to a user’s email inbox. Option 133 Remote Desktop Manager provides an expanded solution for integrating the TNC 640 into the process chain. A push of a button on the control keyboard is all it takes to switch between the control screen and the screen of a Windows PC. It can be a computer in the local network or an industrial PC, such as the Heidenhain IPC 6641 in the machine’s electrical cabinet. This gives the machine operator direct connection from the control to all data handling systems in the process chain, including access to management systems, documentation and visualisation information. Even CPU-intensive CAD/CAM tasks do not affect machining performance. The TNC 640 is Heidenhain’s latest, high-performance milling control and in addition offers optional control of turning functions on a machining centre. It uses plain language programming and has an optimised interface that gives users unrivalled insight into system operation. Functionality for mill-turn centres includes simple program-controlled switchover between milling and turning, comprehensive canned turning cycles for frequently repeated operations such as roughing, finishing, recessing and thread cutting, constant surface speed, and tool-tip radius compensation. Universal and high speed milling cycles are included, such as fast block processing, short control loop cycles and rapid data transfer. The system’s selectable, split screen mode shows part-program blocks in one half and graphics or status display in the other. A smartSelect function presents users with dialogue guidance for selecting functions quickly and easily, rather than using soft key format. Program creation with graphical support while another program is running is provided, and management of a tool changer and a pallet changer is available. 200 London Road, Burgess Hill, West Sussex, RH15 9RD. Tel: +44 (0)1444 247711. Fax: +44 (0)1444 870024. Contacts: Neil Prescott, Managing Director.